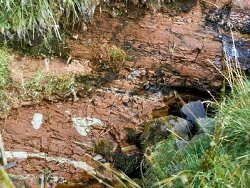 Lower end of stream section in Curraghlane Townland, near Dungiven, Co.Londonderry, exposing red mudstones of the Sherwood Sandstone Group. In this stream section on the western escarpment of the Antrim Plateau, a substantial thickness of Sherwood Sandstone Group red beds is exposed. The Sherwood Sandstone is the earliest formation of the Triassic period and formed around 245 million years ago. The rocks are a mixture of lithologies ranging from reddish-brown, lime-rich mudstones and siltstones to fine to medium grained sandstones. The beds are regular and rarely exceed 20cm in thickness. Although not common, the sandstones show some cross bedding and include occasional, well-rounded quartz pebbles and broken flakes of mudstone. Wind blown desert sands often lose their angularity by abrasion and become well-rounded. In this state they are described as ‘millet seed’ sands and much of the sandstone here consists of grains of this kind. Their red colour is derived from clays rich in the iron oxide mineral haematite. The proportion of sandstones increases upwards in the rock sequence; towards the top beds of coarse ‘millet seed’ sands up to a metre thick are present. These rocks were formed in a desert flood plain. The silts and finer sandstones were deposited by a process called sheet wash. Heavy rain falling on to loose, fine materials such as these mobilises the entire surface which flows, the water eventually being absorbed through the sediment or evaporating. Only in sustained heavy rain will drainage become more defined forming rills and streams. The coarser sandstones were almost certainly sand bars in multi-channelled (braided) streams draining on to lower ground. The ‘millet seed’ sand, originally wind blown, was washed out of such channels. In arid deserts the braided streams are active for only a few days each year and, in extreme circumstances, may be dry for several years. Long rock sections of this quality are uncommon on the western edge of the Antrim Plateau, so this important site should be preserved. It may also provide useful economic information because the Sherwood Sandstone could be a useful aquifer or oil and gas reservoir rock.